You can evaluate the volume of a solid of revolution. A solid of revolution is created by taking a function, or part of a function, and spinning it around an axis — in most cases, either the x-axis or the y-axis. 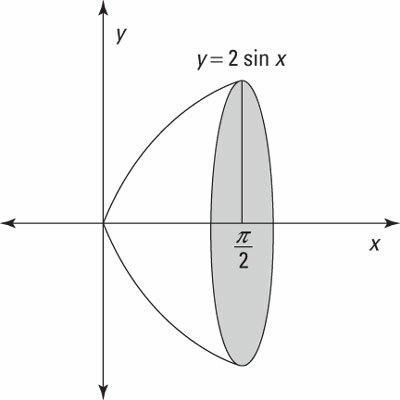 A solid of revolution of y = 2 sin x around the x-axis. Every solid of revolution has circular cross sections perpendicular to the axis of revolution. When the axis of revolution is the x-axis (or any other line that’s parallel with the x-axis), you can use the meat-slicer method directly. However, when the axis of revolution is the y-axis (or any other line that’s parallel with the y-axis), you need to modify the problem. 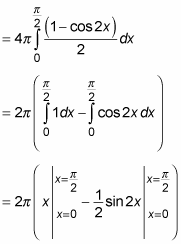 Find an expression that represents the area of a random cross section of the solid (in terms of x). So the volume of this solid of revolution is approximately 9.8696 cubic units.